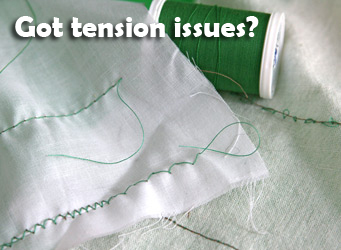 Do you start seeing RED every time you attempt to adjust the tension on your machine? Does that little knob make you tense each time you reach for it? Or maybe someone once told you, "NEVER TOUCH THAT TENSION DIAL!" and you believed them. A class in Mastering Machine Tension will have you calm and in control with no pain-relievers required. Say goodbye to the frustration caused by unwanted thread loops, stitches so tight the fabric puckers and nasty nests of knotted thread. 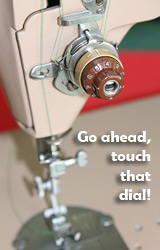 This class will equip you with the knowledge, skills and confidence to master that oh-so-important adjustment on your sewing machine: the tension dial. Students will identify the various factors affecting tension and learn how to compensate for them. By the end of class, expect to have a good understanding of machine tension enabling you to investigate creative sewing applications as well as confidently tackle more complex stitching projects. This is a hands-on workshop; bring your sewing machine (in good working condition) along with your favorite sewing thread. A complete supply list will be sent upon registration. This is a three-hour group class or a two-hour mentoring session.